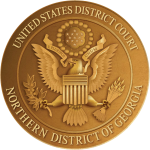 Transcripts of proceedings, taken by Official and Contract Court Reporters before the U.S. District and Magistrate Judges in the Northern District of Georgia, will be filed with the Court in electronic format beginning July 1, 2008. The Court's policies governing redaction from the transcript of specific personal data identifiers, pursuant to Judicial Conference policy, before the transcript is made electronically available to the general public are detailed in Standing Order 08-02 and the Notice to the Bar re Electronic Availability of Official Transcripts. In Standing Order No. 02-01, entered October 17, 2002, the Court recognized the adoption of a national policy on sensitive information and public access to electronic case files by the Judicial Conference of the United States. Noting the Court's intent to make electronic access to court case files available through Public Access to Court Electronic Records (PACER), the Court ordered parties to "refrain from including" or "redact where inclusion is necessary," specified personal identifiers from all pleadings and other civil papers filed with the Court. Pursuant to the E-Government Act of 2002, counsel may file an unredacted document under seal along with the redacted document specified by Standing Order 02-01, if they choose.